Process engineers in charge of designing WAG Injection Systems for mature oil/gas reservoirs will find that McCrometer’s V-Cone Flow Meter® features a space-saver design that reduces both installation and operational costs while improving oil production efficiency. Water-Alternating-Gas (WAG) Injection is an enhanced oil recovery (EOR) technique that helps recover the oil in a mature reservoir, which has been in production for many years. This technique makes it is possible to recover significantly more oil by alternately injecting carbon dioxide (CO2) gas with water. The CO2 gas helps mobilize the remaining oil, while injecting water displaces the remaining oil and gas. In a typical WAG system, the V-Cone Flow Meter is installed as a master meter at the CO2 source with stainless steel piping split run to as many as 16 injection wells. Even with 16 pipe runs, the V-Cone master meter maintains excellent accuracy when the volumes of the16 pipe runs are added together. The meter itself also requires virtually no maintenance – only a simple calibration check of the transmitter. Engineers in the oil and gas industry rely on the V-Cone Flow Meter to remain accurate in the toughest applications. Its low-maintenance, no-moving-parts design is proven to remain accurate for 25 or more years and all but eliminates the need to shut down production for calibrations, inspections or regular primary element replacement. It saves money by increasing production up-time and in parts and labour. With built-in flow conditioning, the V-Cone Flow Meter features advanced differential pressure (DP) technology to nearly eliminate the up- and downstream straight pipe runs required by other dP instruments, such as orifice plates and venture tubes. 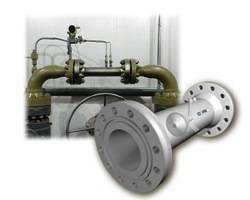 Requiring only 0-3 straight pipe diameters upstream and 0-1 downstream for precise operation, it reduces typical straight run by 70% or more as compared to traditional flow measurement technologies. WAG CO2 gas requires stainless steel piping, which makes the shorter pipe runs required with the V-Cone meter even more economical versus Orifice and other types of meters. It significantly lowers installation costs both in terms of expensive stainless steel piping and the physical size of the CO2 pump room. The V-Cone Flow Meter is inherently more accurate than traditional dP instruments because of the flow conditioning function built into its unique sensor design. Its centrally located cone interacts with the fluid steam, reshaping the velocity profile to provide a stable signal that increases measurement accuracy. The versatile V-Cone Flow Meter is available in line sizes from 0.5 to greater than 120 inches in materials and with flanges compatible with any application. It operates over a wide flow range of 10:1, is accurate to +/- 0.5% and offers repeatability to +/- 0.1%. It features standard beta ratios of 0.45 to 0.85 with custom betas available. It is constructed of rugged Duplex 2205, 304 or 316 stainless steel, Hastelloy C-276, 254, SMO and carbon steels with special materials and testing available on request.